The city by the boardwalk was a full-fledged exhibition of the good, the bad, and the ugly during the academic year of 2010-11. While there were uplifting moments in Santa Cruz, such as the return of the AMGEN Tour of California, much of the news was dominated by the city’s budget woes and a rising crime rate. As the sun sets on another academic year, we look back at some of the storylines that captured the attention of Surf City residents. 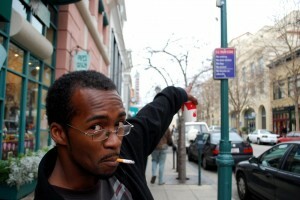 A man smoking on Pacific Avenue points out the law. The smoking ban, seen on the sign, went into effect on Oct. 20 after a one month grace period. CHP Archives. About 10 miles up Empire Grade from UC Santa Cruz in Bonny Doon, an unattended campfire started an 8,000-acre blaze on Aug. 12 that took nearly two weeks, $26.6 million, and more than 2,000 firefighters to contain. The fire was the first of two in the county in 2009. Just four months later, the Loma Fire erupted near the Santa Cruz-Santa Clara county line in October and burned 485 acres. On Sept. 8, the Santa Cruz City Council voted unanimously to pass a public smoking ban, which prohibited smoking on Pacific Avenue, Beach Street, and West Cliff Drive, as well as within 25 feet of any door or window of city buildings open to the public. The ban went into effect on Oct. 20, and after a one-month grace period, anyone caught smoking in restricted areas was presented with a $25 citation. Two months later, the city of Santa Cruz got a “D” for the year of 2009 from the American Lung Association for overall efforts to control tobacco. On Oct. 16, 16-year-old Tyler Tenorio was killed in a gang-related stabbing in Santa Cruz near Chestnut and Laurel Streets, near the Laurel Street 7-Eleven. Tenorio and friends exchanged words with two gang members. They attempted to escape when the argument turned violent and more suspected gang members arrived. Tenorio died on the street, having been stabbed 16 times. One suspect, an alleged gang member, was arrested, while a second suspect is believed to have fled to Mexico. In response to gang-related killings, Santa Cruz resident Analicia Cube founded the organization Take Back Santa Cruz on Oct. 31. The group encourages Santa Cruzans to become active in preventing crime in the city, and held several ‘positive loitering’ events in 2009-10. Local hotspot Santa Cruz Diner made headlines when Food Network’s Guy Fieri featured the restaurant on his show “Diners, Drive-ins, and Dives.” In March of 2010, Fieri was back, this time to film at Aldo’s Harbor Restaurant, giving Santa Cruzans another 15 minutes of culinary fame. 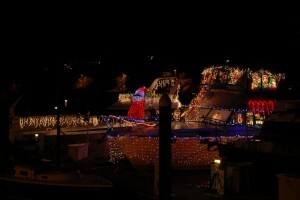 In the Santa Cruz Harbor on Dec. 6, the boat parade celebrated its 24th year. The parade is organized by the Santa Cruz Yacht Club in cooperation with Santa Cruz Port District. The year 2010 started off on an ominous note in Santa Cruz, with the Jan. 1 murder-suicide of 24-year-old 7-Eleven salesclerk Nichole Schrock and her 42-year-old ex-boyfriend Illya Cavlan. This was followed up by the double homicide of 21-year-old Alejandro Nava-Gonzales and 18-year-old Oscar Ventura at an apartment complex on Canfield Avenue. Jamie Galdalmez-Guevara, 18, is suspected of pulling the trigger, and was apprehended in the Central Valley. He is currently awaiting trial. After conducting a safety inspection of the building, county officials announced the indefinite closure of the auditorium, due to concerns that it would not be structurally sound in the event of an earthquake. The Vets Hall, which is a registered historical landmark of Santa Cruz, previously served as a venue for concerts, as well as providing much-needed services for veterans. Twenty-four of the world’s best surfers braved the 50-foot swells at Mavericks on February 13 to compete in the renowned surfing competition. Chris Bertish of South Africa took home first place, with Santa Cruz resident Shane Desmond earning second place. Four men were wounded and two arrested after a gang-related altercation on Feb. 13 outside the Red Restaurant and Bar near the intersection of Cedar and Locust Streets. This incident turned out to be one of several local gang-motivated crimes that occurred throughout the academic year. On March 1, two previously-free downtown Santa Cruz lots became pay lots. The Cedar and Church Streets Parking Garage and the Cedar and Cathcart Streets Parking Lot now cost $.50 an hour, or $5 a day for parking in order to generate additional city revenue. The Santa Cruz Police Department announced the team-up of the city of Santa Cruz with the website crimemapping.com. The site offers real time information to make it easier for the community to keep track of crime in and around Santa Cruz. Erik Lippman, a 30-year-old autistic man, disappeared in April but his body was later found at Marina State Beach after a county-wide search. CHP Archive. 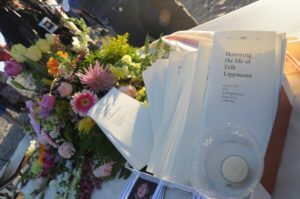 On the evening of April 24, 19-year-old Santa Cruz High School graduate Carl Reimer was shot and killed by alleged gang members at Grandview Park after going to retrieve a skateboard and bike that he and his friend had left there earlier. Reimer had been close friends with 16-year-old Tyler Tenorio, who was stabbed and beaten to death in October 2009. Much like the murder of Tenorio, Reimer’s death prompted outrage and concern in the community over increasing gang violence, and prompted Take Back Santa Cruz to host a Positive Loitering event at the park where he was killed. The Santa Cruz City Council passed an idea proposed by the Downtown Association to install refurbished 1950s parking meters to benefit the homeless. The program, called Imagine Positive Change, will allow people to deposit change that will go toward helping local homelessness projects in the city. It was met with mixed controversy from activists who fear it may discourage panhandling. The 30-year-old autistic man was reported missing on April 21, prompting a county-wide search by family members, friends, and volunteers and the creation of a Facebook group dedicated to finding him that acquired nearly 6,000 members. The search came to an end, however, on April 29, when Lippmann’s body was found at Marina State Beach. The coroner determined Lippmann had died from accidental drowning. What began as a dance party in support of labor rights quickly escalated into a separate riot on the evening of May 1, when a group of alleged anarchists began throwing jugs of paint at police cars. They smashed storefront windows and tagged buildings with anarchist symbols and anti-capitalist phrases. By the time riot officers from the SCPD and neighboring agencies arrived on the scene, 18 businesses had sustained estimated $100,000 of damage. Since then, two transients have been arrested in connection with the riot, and the FBI has gotten involved in the investigation. The anarchist café SubRosa, located on Pacific Avenue, has been accused of having ties to the riot, because one of the two individuals arrested admitted to picking up a flier for the dance party there. However, the café has repeatedly denied any involvement with the event or the subsequent riot. The 6th annual AMGEN Tour of California finished the third stage of the renowned bike race at the Boardwalk in front of a crowd of 20,000 people. The race, which featured seven-time Tour de France winner Lance Armstrong and 2009 AMGEN Tour winner Levi Leipheimer, came to Santa Cruz for the second year in a row. This year contestants finished at the Boardwalk instead of in downtown (as was the case in 2009) in order to accommodate more spectators. Shortly after bringing in the Drug Enforcement Administration (DEA) and Immigration and Customs Enforcement Unit (ICE) to help combat gang and drug violence in Santa Cruz, a 26-year-old transient was shot and killed on May 28 in an apparent drug deal gone bad. The homicide marks the fifth of 2010 for Santa Cruz, which surpasses the 2009 mark of four. Both in 2009 and so far in 2010, three of the murders have been gang-related. On June 25, the Santa Cruz Metro board will decide whether or not to cut late-night service between UCSC and downtown, as well trim down or eliminate more than 20 other routes. A Facebook group entitled, “Emergency: Save Metro UCSC Night Routes” has already gained more than 1,300 members in support of keeping late night buses running. UCSC has recommended keeping the Night Owl service and paying the Metro more to operate it. The Santa Cruz Police Department will host a meeting on Wednesday, June 9 at the Santa Cruz Police Department from 6:30-8:30 p.m to discuss its efforts to curb gang violence with local, state, and federal resources. Mayor Mike Rotkin, SCPD representatives, and city councilmembers are expected to be present at the meeting.